Erie-LaSalle Body Shops principals-Bob, Jim and Jay Gottfred, announced the addition of a third location in the Chicago market. Erie-LaSalle is a family owned and operated multi shop repair center founded in 1934. Erie-LaSalle’s new facility is located in the River West neighborhood of downtown Chicago. 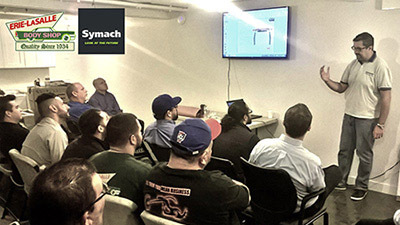 It will the first shop in the United States to employ the Symach European repair process. This process integrates precise scheduling, repair planning, state-of-the-art repair and refinish procedures-enhanced by patented gas catalytic [Drytoronic] robotic drying . 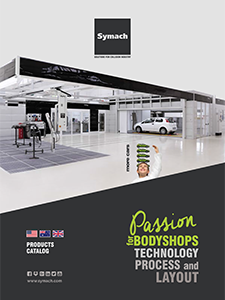 Symach is the company worldwide leader in automated car body shops. 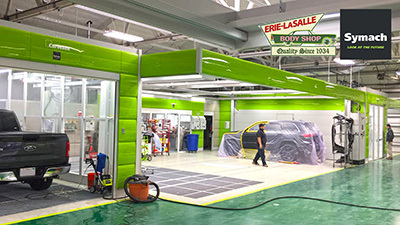 This is the first body shop we are implementing in US market, “stated Osvaldo Bergaglio”, I have personally projected the shop considering efficiency, quality, volume of production and aesthetic design, my international team will install and will do training for 4 or 5 weeks to all the staff and managers of the new shop, giving Bob, Jim and Jay the guarantee of success. ‘ We have always prided ourselves in being a leader in the latest technology in our industry ’ states Erie-LaSalle owner Bob Gottfred. ‘ When we decided to open another repair facility we wanted to offer our clients and insurance repair partners something better-something no one else had offered providing the very finest in SERVICE, SPEED and ACCURACY ’. We feel both our internal [employee team] and external customers deserve the very best. We have dedicated ourselves to invest more to give more.